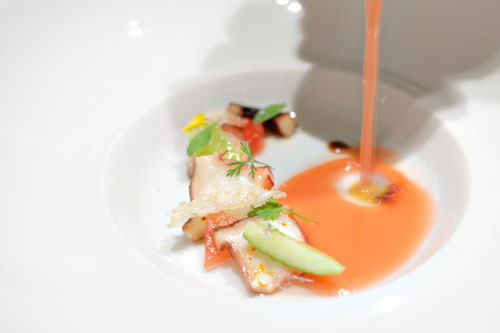 Since debuting all the way back in 1989 (when it was still located at the current site of Providence), Joachim Splichal's flagship Patina has been a mainstay on the Los Angeles dining circuit. Certainly, the place hasn't always been the trendiest, the hippest, or the most of-the-moment, but what it has done is consistently turned out fine dining-focused fare, and given birth to a veritable mini-empire of other PRG restaurants. Over the years, Patina has played host to a number of chefs, and the latest in that line-up is one Charles Olalia, the restaurant's former sous who replaced Tony Esnault in June. Esnault, it turns out, has teamed up with Church & State's Yassmin Sarmadi, and the two are planning to open Spring in Downtown, a French restaurant situated on the spectrum somewhere between bistro and fine dining (sounds like Walter Manzke's upcoming République). But that's not the only part of the kitchen shake-up. Former Pastry Chef Joel Reno left late last year to open his own pastry shop, Baguetier in Huntington Beach, and has since been supplanted by Kasra Ajdari, whom you may recall from Raphael. About the Chefs: Chef Olalia was born in the Philippines, and after taking on an interest in food at an early age, attended and graduated from the International School for Culinary Arts and Hotel Management in Manila. Following some time spent in his homeland, Olalia moved Stateside, landing at the Ritz-Carlton Half Moon Bay. 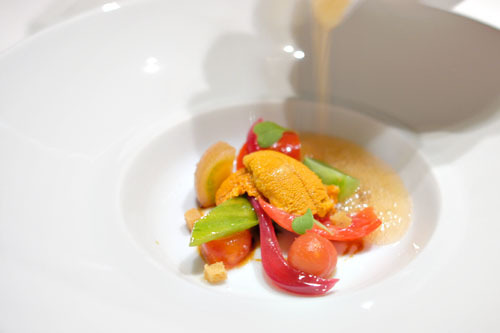 In 2008, he became a chef de partie at the Las Vegas outpost of Guy Savoy, under Executive Chef Eric Bost (who has since decamped to helm Savoy's Singapore restaurant). Afterwards, Olalia served as a commis at Thomas Keller's famed French Laundry, then became Executive Sous Chef of the Village California Bistro in San Jose. From there, he moved on to a gig at Oracle, then, sick of the corporate world, he left and staged at a number of places in the Bay Area, including the Michelin-starred Dio Deka, Dan Patterson's two-star Coi, and Chris Kostow's three-star Meadowood. Olalia then relocated to Southern California in 2010, finding employment at Patina under Tony Esnault. After working here for two years, he assumed the Chef de Cuisine role in June 2012 following Esnault's departure. A Southern California native, Kasra Ajdari's interest in food grew from inside his family's kitchen, under the tutelage of both his parents and grandparents. After graduating from Valencia High School in 2001, he enrolled at the University of California, Santa Barbara and was well on his way to becoming an attorney before he started experimenting with bread baking at home. This weekend hobby soon consumed his free time, and he decided that his future would be in the food industry. In pursuit of that goal, he attended the California School of Culinary Arts in Pasadena after finishing up at UCSB in 2007. While still in school, he was introduced to Adam Horton, and after graduating from the CSCA's Le Cordon Bleu program in 2009, Ajdari quickly found employment under Horton at Saddle Peak Lodge. He followed Adam to Studio City's Raphael in early 2011, but left in February to take on the Pastry Chef role left vacant by Patina's Joel Reno. Inside, things have largely remained the same since my last visit, with perhaps the notable exception of the lighting being distinctly less yellow (a blessing for photographers). As far as Patina's menu goes, the standard à la carte selections and seven-course tasting menus are still available, joined now by a more affordable "Market Menu" offering. We, however, opted for an extended, by-special-request-only 15-course Grand Menu Degustation at $150 per head, plus $90pp for wine pairings by Sommelier Silvestre Fernandes. Click for larger versions. 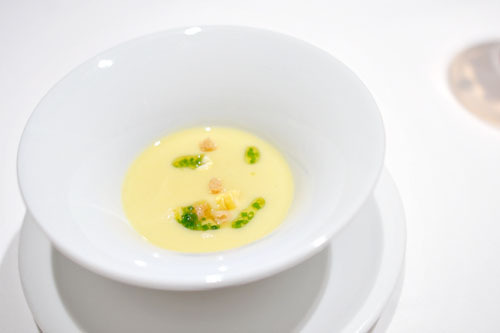 Olalia commenced with his amuse bouche of chilled sweet corn soup, with crostini and chive oil. It was a great start to the meal, chock full of bright, refreshing, summer-y nuances. The corn was certainly sweet, but not overly so, and I appreciated the saltiness and crunch contributed by the toast, as well as the offsetting tang of the chive. 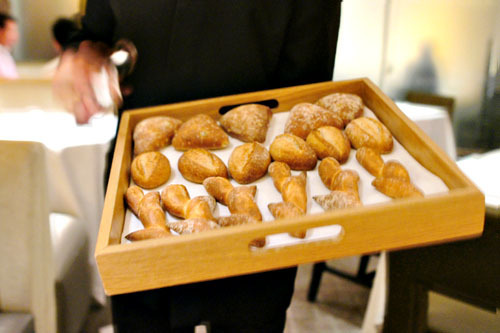 Bread on offer this evening included pain de epi baguette, seven-grain, and green olive varieties. The summertime spirit started by the corn soup continued on through our first course proper. Tender, yet chewy slices of octopus were spot on, joined by an amalgam of cilantro, cucumber, celery, and various other elements that made for a delightful mix of disparate textures and tastes. A watermelon liquid with garlic and olive oil, meanwhile, contributed an enveloping, integrating dash of sweet and savory that beautifully wrapped everything together. A fraicheur of crab was refreshing to say the least, living up to its name. Indeed, the Dungeness was on proud display here, its saline sweetness becoming the clear hero in the dish, melding gorgeously with the mango. At the same time, a deft combination of microgreens, tomato gel, avocado mousse, and basil seeds lent a tart, herb-y bent to the course that rounded things out perfectly. The so-called "Heirloom Tomato Salad" has become a trite sight on menus these days, but Olalia's version was anything but. Tart red peppers joined with bright, juicy bits of tomato to form a sort of sweet 'n' sour complement to the lush, briny relish of sea urchin, while a broth of tomato water laced with bonito contributed a rich, savory, almost dashi-like flavor to the dish that smartly tied all the elements together. 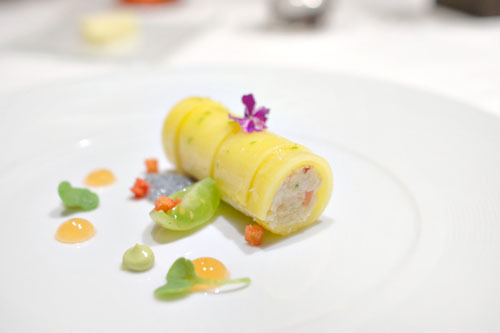 The next course was ostensibly inspired by Chef Olalia's time at Guy Savoy, in particular a dish called Tout Petits Pois, or "Peas all Around." 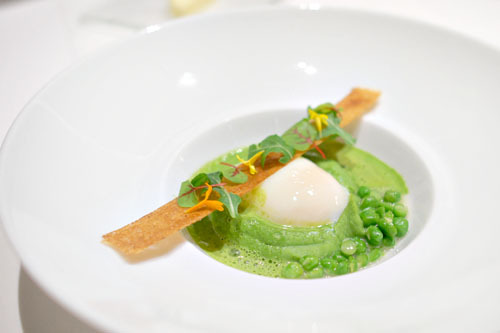 We had here a pea purée, fresh shucked peas, an arugula-calamondin foam with Tabasco, an Espelette pepper tuile, and microherbs, all with a beautifully poached egg. Indeed, the bright, verdant zest of the peas was forcefully conveyed here, augmented by the airy foam yet adeptly weighed down by the rich, luxurious, runny yolk. 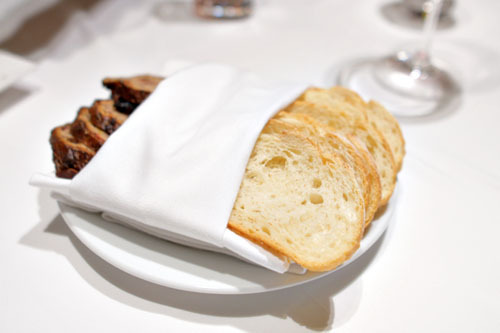 The tuile was also well-placed, offering up an offsetting crunchiness to the course, as well as a salty, savory component. I was particularly fond of the wine pairing here as well, a white Bordeaux that showed off a delectable vegetal component that worked wonderfully with the peas. 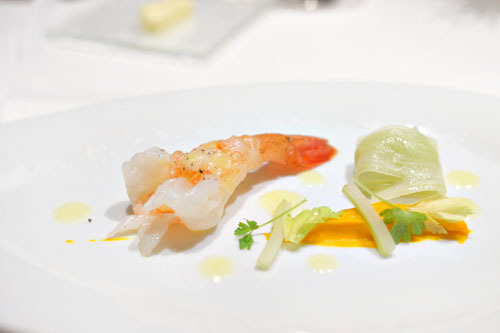 Chef Olalia's presentation of spot prawn was successful in paying homage to the vaunted crustacean. The shrimp was cooked superbly, showing off a snappy, supple bite and a delicate taste keenly accented by a touch of lemon and olive oil. 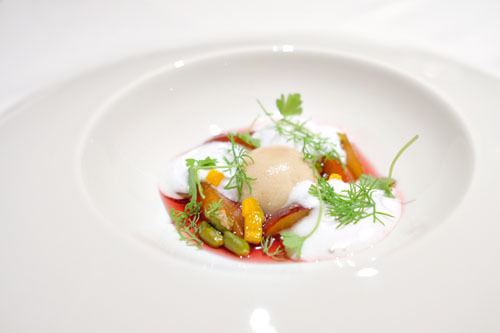 At the same time, a salad of celery contributed a crisp, clean brightness and countervailing astringency to the course, and I even enjoyed the spicy, ginger-y carrot mousse, which I'd feared would be overly sweet. Gnocchi were dense and doughy, yet with a certain appealing fluffiness that I appreciated. 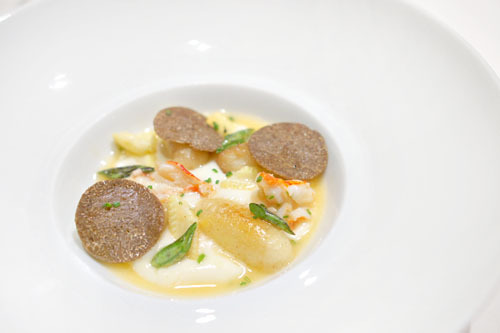 Along with the pommes mousseline, they formed a fitting base to the course that really allowed the snappy bits of lobster and crunchy green beans to shine, while the whole dish was integrated by an earthy veil of truffle. Interestingly, we likened this to a similarly-profiled porridge dish that we'd had recently at The French Laundry, and we all preferred this version. 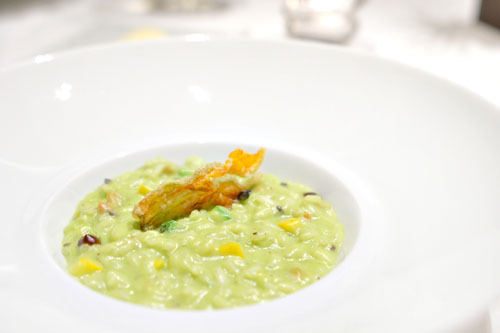 The kitchen inserted this special risotto per one of my dining companion's request. Based on zucchini, it was a perfect version of the dish for the summer time: light, with bright vegetal flavors over firm, al dente grains of rice, tied together by crème fraîche and tarted up by the inclusion of black garlic preserves. The fried zucchini blossom, meanwhile, added a lovely crunch and saltiness to the fray. 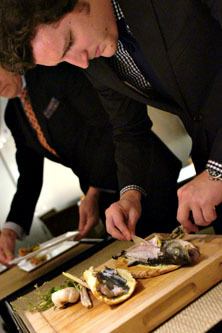 At this point, one of our servers brought out a beautiful pastry-encrusted black bass from Greece, and preceded to carve and plate the fish. 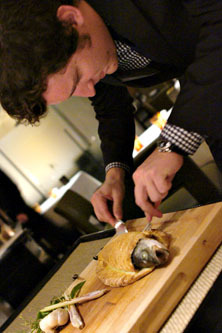 You don't see tableside prep too often these days, so I definitely appreciated the effort. 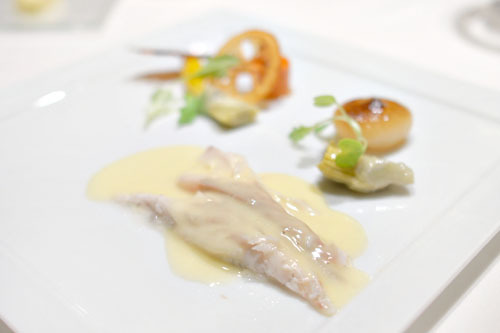 After being filleted, our loup de mer was dressed with a shallot-garlic-white wine-lemon verbena-lemongrass sauce, then accompanied by glazed carrot, artichoke, cipollini onion, bacon, and a dehydrated lemon tuile. The fish was right on: supple and delicate, with a fantastic lemon-y tone to it that really sang with the sea bass' various accoutrements, the salty bacon in particular. Black cod showed off a wondrous texture, with a near falling-apart consistency and a hefty, yet mild taste that was keenly highlighted by the piquant purslane and piquillo present. Shelling beans, meanwhile, did a great job in grounding the dish, but I was a bit less enthralled by the almond foam and toasted bits of almond, which seemed a tad too pronounced in their nuttiness. 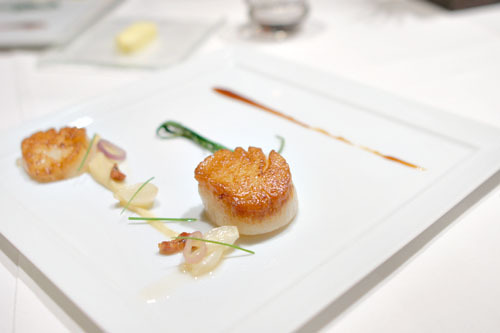 Maine diver scallops arrived with onion soubise, lardons, baby shallot, and a line of maple-balsamic. They were pretty much spot on, with a firm, yet yielding consistency, perfect caramelization, and a great show of salinity. I really enjoyed them with the various forms of Allium, their tanginess offsetting the richly-flavored scallops beautifully, but the real surprise was how well the sweet maple melded with the bivalves. Snake River pork made an appearance in two presentations: loin and belly. Loin can often seem a bit boring, but here it was delicious: tender and juicy, with a refined porcine relish that paired wonderfully with the herb-y, fennel notes in the dish. The belly, meanwhile, was also commendable, with a prototypically rich, fatty character underscored by a delightfully crisp, salty skin that showed off an almost chicharrón-esque flair. 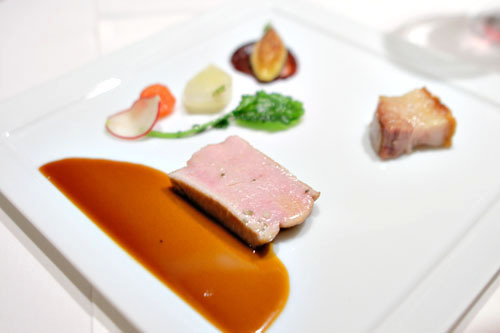 In our final savory course, lamb was delivered to the table in a duo of preparations. 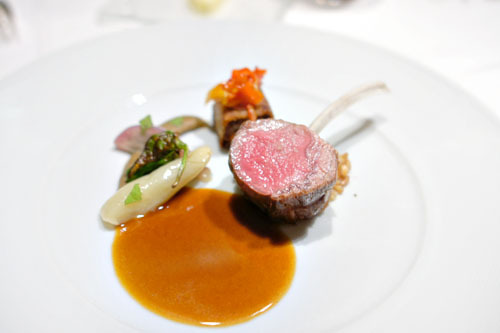 I was definitely a fan of the expertly-cooked rack and its quintessential ovine flavors, delectable alone but also excellent when taken with a mix of Japanese eggplant, Indian eggplant, farro, and shishito peppers. As good as that was, though, the confit'd, shredded lamb meat stuffed in filo dough was even tastier, with a profound, heady richness and depth that was perfectly paired with its pastry crust. 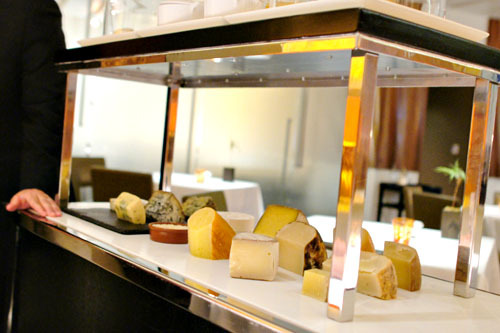 The presentation of the cheese cart: always a pleasant sight. 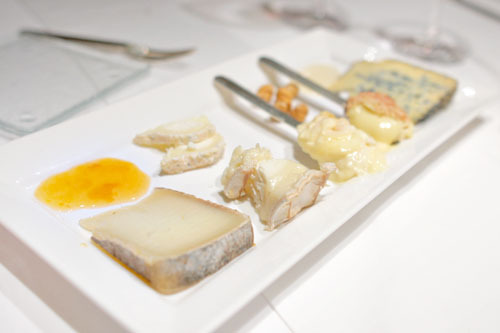 Six varieties of fromage were presented in an appealing cheese plate. We had, from front to back: Capriago, a subtly salty goat's milk varietal from Bohemian Creamery in Sebastopol, CA; a tangy, soft Sainte-Maure from France; Cowgirl's creamy, mild Cana de Cabra; the cow's milk Saint-Marcellin, with its mushroom-y flair; the legendary Époisses de Bourgogne, one of my all-time favorites; and finally the big, bold Caveman blue from Rogue Creamery in Oregon. Accompanying the cheese was French acacia honey, kalamansi compote, toasted hazelnut, and two types of bread. With the savories dispensed with, it was time for new Pastry Chef Kasra Ajdari to shine. For our first dessert, he prepared a dish that he's planning to present at the upcoming StarChefs International Pastry Competition. It was a reimagined version of tom kha gai, the classic Thai soup made with coconut milk, galangal, lemongrass, chicken, and herbs. All the elements were well-represented here, with the dessert really capturing the essence of the soup. 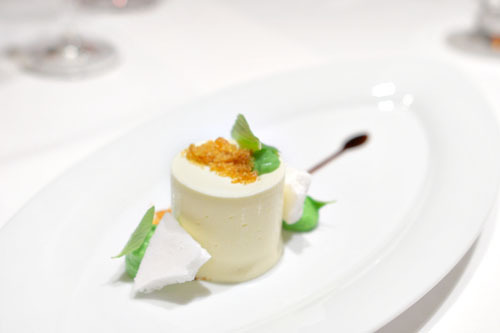 The sweetness of the semifreddo paired admirably with the lemon-y notes in the dessert, all while the cilantro and Vietnamese mint added a fantastic herbal tinge to the entire dish. The coolest thing here, though, was the use of chicken skin, its immense savoriness rounding out the course nicely. 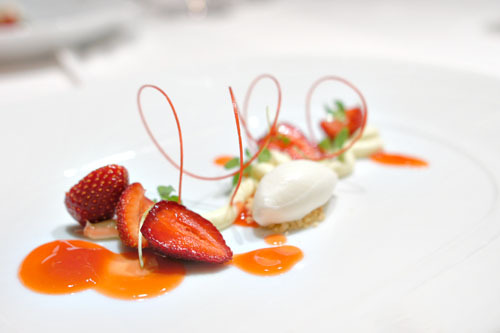 Halved strawberries from vaunted producer Harry's Berries were accompanied by a crème fraîche custard, buttermilk ice cream, elderflower jus, basil, and a thin ribbon of strawberry tuile. The berries were clearly the hero in the dessert, really delivering the pure, unmitigated essence of the fruit, while the combo of crème fraîche and buttermilk added a creamy, lactic counterpoint to the berry. Fantastic herbaceousness from the basil, too. 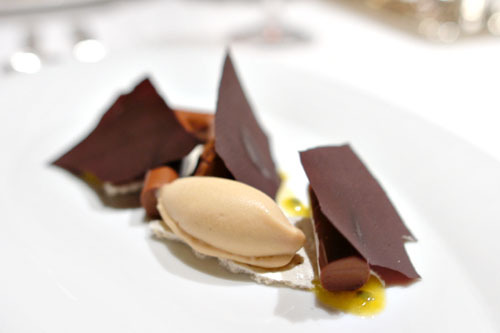 The final, chocolate-based dessert played off the classic French dacquoise and featured hazelnut and chocolate meringues, chocolate mousse paper, hazelnut sorbet, as well as passion fruit. It was an effective use of the traditional flavor profiles, with a deft mix of chocolate-y and nutty flavors, all countervailed by the bright, tart, tangy nature of the fruit. 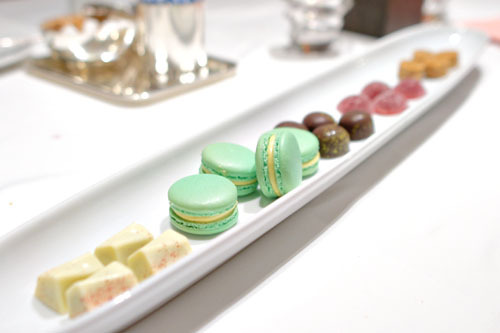 Mignardises comprised pistachio-rose bonbons, pistachio macarons, passion fruit-dark chocolate bonbons, strawberry-blueberry pâtes de fruits, and peanut butter and fudge chocolates. The team: General Manager Kevin Welby, Sommelier Silvestre Fernandes, Chef de Cuisine Charles Olalia, Pastry Chef Kasra Ajdari. Olalia and company managed to exceed expectations this evening, making this dinner my strongest meal at Patina to date. Compared to the food of his predecessors, the new Chef's cooking seems to be lighter in character, with a more casual, more Californian, less pronounced French bent to it. There's an effective emphasis on brightness, acidity, and astringency, along with intelligent incorporation of disparate textures. Ajdari's desserts, meanwhile, are keenly contemporary, managing to be novel (and beautifully plated) without seeming overwrought. Fernandes' wine pairings were praiseworthy as well, as was the service directed by Kevin Welby, making for a confluence of factors that resulted in a near flawless meal. I was a bit concerned when I heard that Tony Esnault was leaving, but the restaurant is holding up just fine, making now as good of a time as ever to (re)visit Patina. I am by no means a die hard locavore but Greek bass? Really? Great review! Love how involved and bright their fruits and veggies are. Mike: To be fair, I don't believe the fish is available locally, at least not in the wild. If you want European seabass, you pretty much have to source from Europe. Anon: Indeed--great color on those plates. But that's exactly it. I don't understand the insistence on serving European seabass when there are plenty of other fish swimming in the sea between here and Greece. It just seems a little weird to fly in a fish from the other side of the globe. 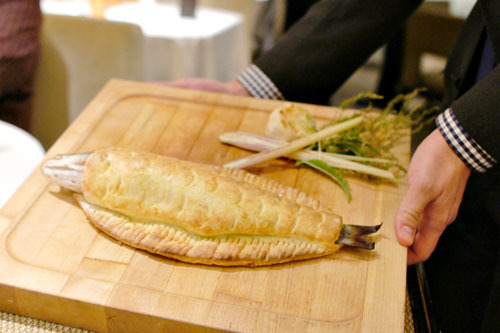 There are indeed plenty of other fish around these parts, but the question then becomes: are any more suitable than the aforementioned sea bass for the desired "en croute" preparation? I think people have gotten carried away with requiring locality in their food. When I eat something, the most important thing is whether it tastes good or not. This may not apply to a place in southern CA, but what about restaurants/chefs/consumers whose location doesn't allow for local produce and proteins? Should they just stop cooking and eating, or should they utilize the resources available to get the best possible items, regardless of where it comes from? More restaurants need to bring back tableside service. That uni dish looks amazing. Oanh and I would be all over that! Anon: No, they should all up their game to become Noma-like, ha! Seriously though, Jose Andres said the exact same thing to me--use the best you can get, with location being a secondary concern. I don't think anything about farm-raised Greek seabass tastes good. The issue for me is, if you use the same products as every other restaurant, how can you set yourself apart?